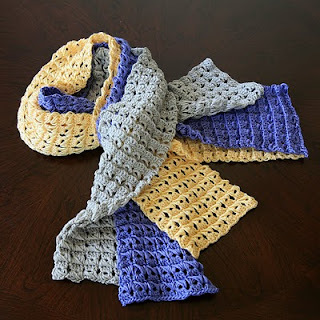 Lightweight and silky next to the skin, this hand-crocheted scarf can be worn all year round, indoors and out. This is the first item in my new Wildly Woven collection; made of non-wool fibers for wool-sensitive types. I love the feel and drape of this bamboo/acrylic fiber — sumptuous: it's like giving your neck a spa day! You can grab a cozy custom scarf for yourself — just go to my Etsy shop. Currently available in light taupe, periwinkle, and butter.